DNA matches without pedigree information are more difficult to analyze. One of the features of GedMatch (much of which is free to use) is the ability to attach a GedCOM file to a submitted DNA test. That GedCOM file is used to create pedigree and other family based charts that can be viewed by any member of the site. One way to “pick the easiest” genealogical fruit from the DNA files at GedMatch is to look at those submissions that have attached GedCOM files. This is a limited approach and does not reach all submissions by any stretch, but it can be a way to pick through the results and make some quick conclusions about how certain test kits are actually related to you. 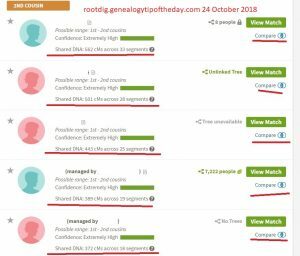 See which of kits that match a DNA test have GedCom files. The ability to view a list of kits that have attached GedCOM files is one of the free features of GedMatch. It’s available under the “Genealogy” section of the site. (Reminder: your results on GedMatch are not immediately available after submission–it takes time for your submission to process and be connected to the other data on the site). The list contains links to the kits that have attached GedCOM files and those actual GedCOM files. The files can then be browsed. It’s easy to get excited and mindlessly go through whichever ones look most likely to be helpful. It can also be easy to go in circles looking at the same file multiple times and (hopefully) reaching the same conclusion multiple times. This is where it’s advised to track what’s being done instead of repeatedly doing it. The results screen–kit number and GEDCOM ids have been removed. I then copied the “data grid” and pasted it into a clean spreadsheet. For me, the “X” DNA columns weren’t going to be helpful, so I eliminated them. I added a column for whether the chart had been viewed, for names in the chart (only including ones that “struck a nerve”), and “Misc.” (for comments). What I need to add is a column for male connecting ancestor and female connecting ancestor as well. This chart is simply for me to keep track of which GedCOM files I have viewed and reduce the amount of repeated work that I do. This chart is not to track all the analytical details and other information–it’s just a research log of sorts. The problem is that this of DNA matches that have attached GedCOM files is not static. It’s changing as new submissions are added. One way to partially deal with this problem is to use the features that are a part of the Tier 1 membership at GedMatch.com. 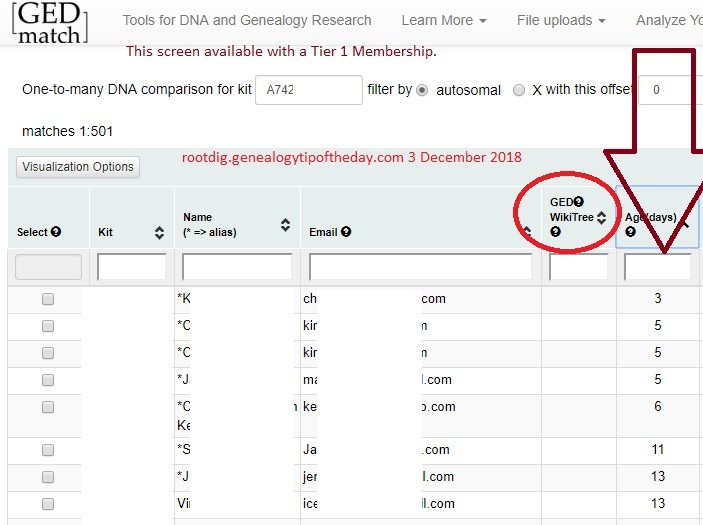 The “One to many DNA comparison” screen in the Tier 1 membership allows for a sort by the age of the submission and see if the submission has an attached GedCOM file. If I indicate on my chart of DNA matches with GedCOM files when that chart’s list of entries was last updated, I can add new kit numbers manually to the chart. One limitation with this approach is that the “age” won’t indicate if an older submission of DNA has recently had a GedCOM file attached to it.